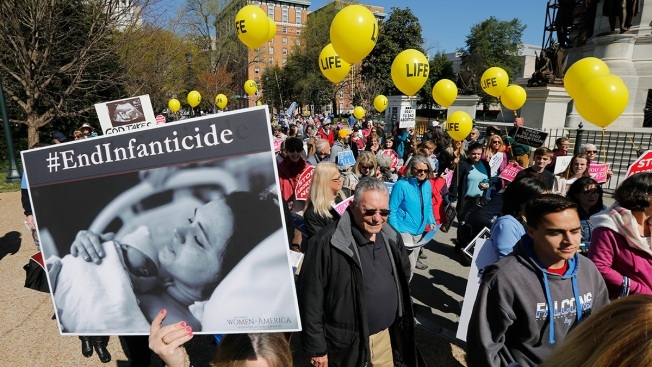 A group of anti-abortion marchers carry signs and balloons as they march to the Virginia Capitol in Richmond, Wednesday, April 3, 2019. Anti-abortion advocates have held a large rally at the Virginia state Capitol to oppose looser late-term abortions laws. The advocates gathered on the Capitol's south portico Wednesday as lawmakers returned to Richmond to take up Gov. Ralph Northam's vetoes and amendments. A push by Virginia Democrats to weaken restrictions on late-term abortions erupted into a fierce partisan clash earlier this year because of a viral video in which a lawmaker acknowledges her legislation would allow abortions up until moments before birth. Critics also accused Northam of backing infanticide because of comments he made in a radio interview describing the hypothetical medical care given an infant who is severely deformed or unable to survive after birth. Democrats said their views have been deliberately mischaracterized by Republicans for political gain.